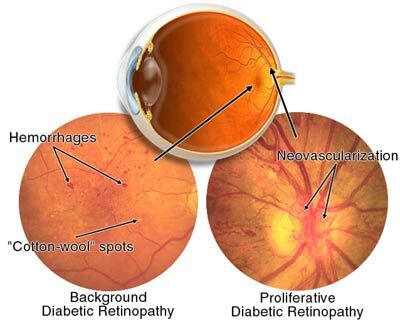 3 How is diabetic retinopathy treated? 4 Are there risk factors for developing retinopathy? 5 How can diabetes-related eye problems be prevented? Diabetic retinopathy is a serious eye problem associated with diabetes. It is the leading cause of legal blindness in the working age population. Diabetes, a disease that causes too much sugar to enter your bloodstream, can affect your eyes and your vision. Fluctuating or blurring of vision, occasional double vision, loss of peripheral vision as well as flashes and floaters within the eyes may be symptoms related to diabetes. Sometimes the early signs of diabetes are detected during a thorough eye examination before the patient is aware of any problems. Diabetes can cause changes in nearsightedness and farsightedness and lead to premature presbyopia (the inability to focus on close objects). It can result in cataracts, glaucoma, a lack of eye muscle coordination (strabismus) and decreased corneal sensitivity. The most serious eye problem associated with diabetes is diabetic retinopathy, which, if not controlled, can lead to blindness. Diabetes, over a long period of time, can change the structure of the retina, which is the light sensitive layer at the back of the eye. As it progresses, tiny new blood vessels develop. These can leak fluid and/or start to bleed, leading to blindness if untreated. In the early stages, diabetic retinopathy can be treated with laser therapy. Several tiny light burns are made on the retina, which causes the abnormal leaking new vessels to shrink and often disappear. In other cases, surgery inside the eye may be necessary. Early detection of diabetic retinopathy is crucial. It is routinely screened for in an eye examination. Inadequate control of the blood sugar is the most important risk factor. There are several factors that increase the risk of developing retinopathy including smoking, high blood pressure, drinking alcohol and pregnancy. By monitoring and maintaining control of your diabetes. See your physician regularly and follow instructions about diet, exercise and medication. See an eye care specialist for a thorough eye examination when you are first diagnosed as a diabetic, at least annually thereafter and more frequently if recommended. Learn about our portable screening unit here!